Geoff Best Gives A Little Insight To This Commited Aviatrix Along With Several Other Women Fliers Also From Wanganui. Photographs Never Lie. Or Do They? Gerard Morris Explains How To Get One Great Shot From Several Not-So-Great Shots. 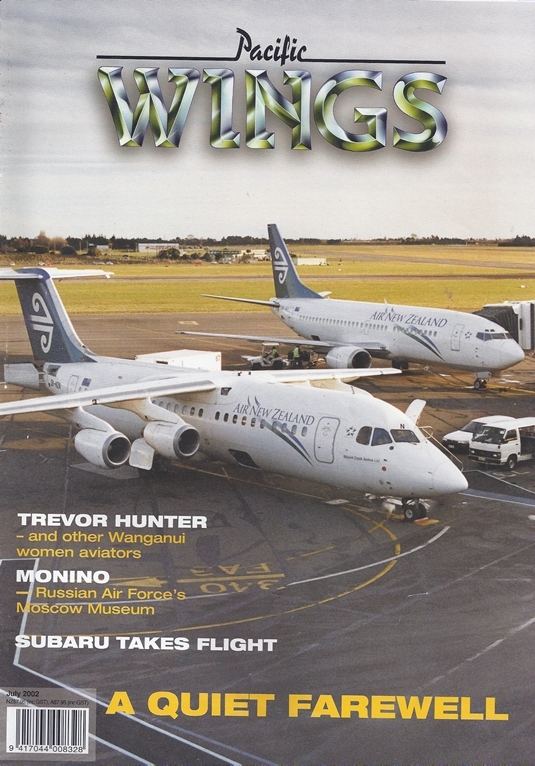 As The BAe 146 Departs Our Shores, Peter Clark Researches The Background To This Unique Aircraft, Its Service In New Zealand And Briefly Details Its Last Flight. Correspondent Mike Feeney Was At The RNZAC's 2002 Coference And Agm In Wellingtion Last Month And Filed This Exclusive Report. We Take A Look At A Hamilton-Based Company, Sub4, That Has Re-Designed The Humble Subaru Ea81. Peter Cooper Filed This Largely Pictorial Report On The Recent Aviation Show At Berlin Schonefeld, And Airfiled In The Former ""Eastern (Russian) Sector"" Of Germany. Ian Boag Recently Visited A Russian Military Aviation Museum Near Moscow, Here, He Takes A Pictorial Look At The Impressive, If Quietly Deteriorating, Museum. Zins Arrive: The New, And The Not-So-New; Lancashire Prospector Arrives.